Each system is easily customized to your home’s unique configuration and your needs. We will work with you to find the solution that’s right for you. 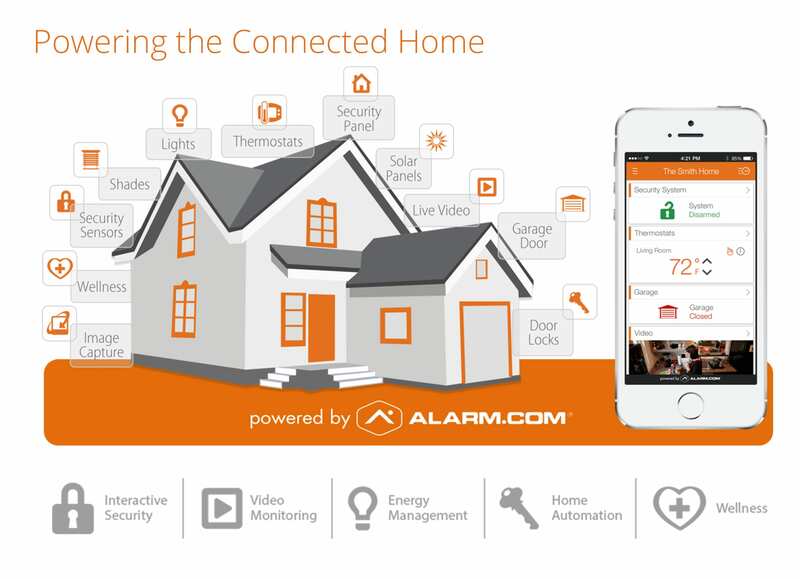 With Alarm.com, we can connect your security system, lights, locks, thermostats, video cameras, temp sensors, flood sensors and more — for seamless automation and control through just one app. No other solution is a good and tightly integrated as Alarm.com. Internet or broadband down? No problem as it doesn’t use your internet! Give friends and family their own codes and get a notification when they’re used. Add an Alarm.com doorbell camera and unlock the door while talking to your visitor right from the in call button. See who’s at the front door and speak to visitors via two-way audio from anywhere with the Alarm.com WiFi Doorbell Camera. Keep an eye on your kids, elderly loved ones and even communicate with them via two-way audio with Alarm.com indoor cameras. Our latest indoor camera even has a Push To Call button for calling right from the camera! Monitor around your property with Alarm.com outdoor cameras. Alarm.com Smart Home Security is available with BRINKS Home Security for 24/7 Police/Fire/Medical emergency response and starts @ $29.95/mo. Alternatively, Alarm.com Self Monitoring packages are available starting @ $12.95/mo.